Gauntlets do not just come in steel and other varieties of metal, especially not when leather can be just as protective and just as desirable. A Single Leather Gauntlet can be quite the accessory to have, creating a distinctive look that is all your own. 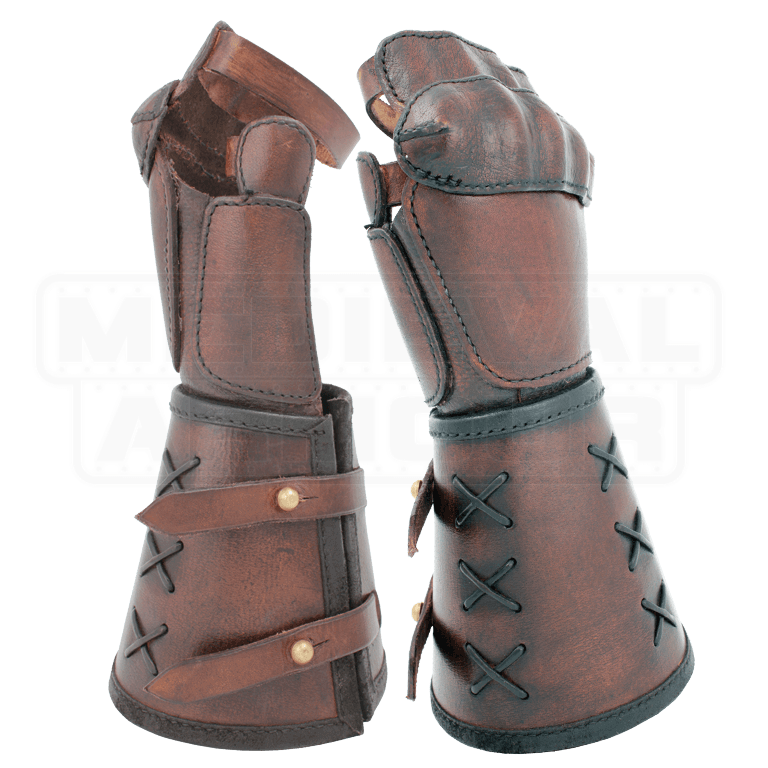 As their name suggests, these gauntlets are sold individually, which means that these are perfect for armoring one hand, leaving the other free for use in a variety of tasks. The gauntlets are similar in construction to a metal gauntlet, consisting of leather plating that wraps around the forearm and wrist and secures in place, while also featuring shorter, segmented leather plates that protect the back of the hand, the knuckles, the thumb, and even the beginning of the finger. Short leather straps secure the gauntlets cuffs in place, while allowing for limited adjustment of sizing. The gauntlets are available in only one size, although they do come in brown or black. They also come in left-handed or right-handed varieties, allowing you to pick which hand you armour. Or, if you so desire, you can pick up two to wrap both hands in leather armour. Rogues and assassins might particularly benefit from just having a Single Leather Gauntlet, as it might be their off-hand, which frees up their main hand to perform more dexterous tasks, like picking locks, making poisons, and other nefarious purposes. Or perhaps you just want the distinctive look that comes from wearing just one gauntlet. Either way, it is your choice. 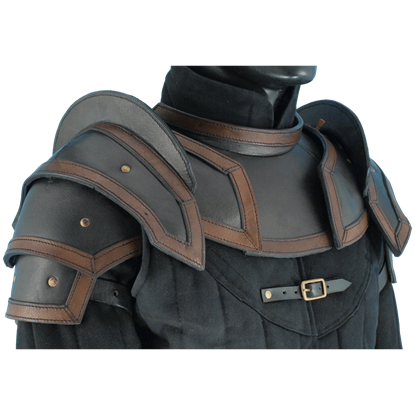 Our Shoulder Armour with Neck Guard is great for those who do not want to wear a breastplate or cuirass, as the pauldrons connect right to the included neck plate. It is crafted from 8-9 oz. leather and available in black or brown. When it comes to armor, the Vikings preferred something functional and light. If you fell overboard while traveling, plate armor made it hard to swim. 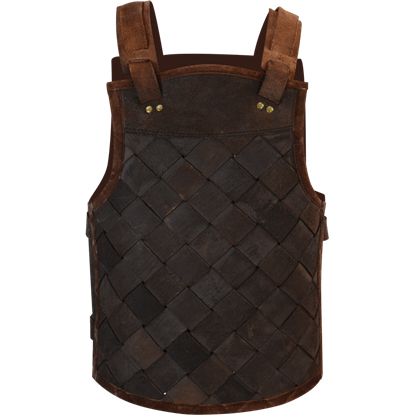 This RFB Viking Leather Armour is affordable LARP armor with a Viking style.